In my previous article, What’s new in SQL Server Management Studio 17.2; Authentication methods, scripting options and more, we discussed deeply the new features and enhancements that are included in the SQL Server management Studio 17.2 release, and mentioned that starting from SQL Server 2017 version, SQL Server Management Studio starts taking its own versioning track, that starts with 17.X rather than taking the same SQL Server Engine version number for SQL Server 2017, which is 14.0. 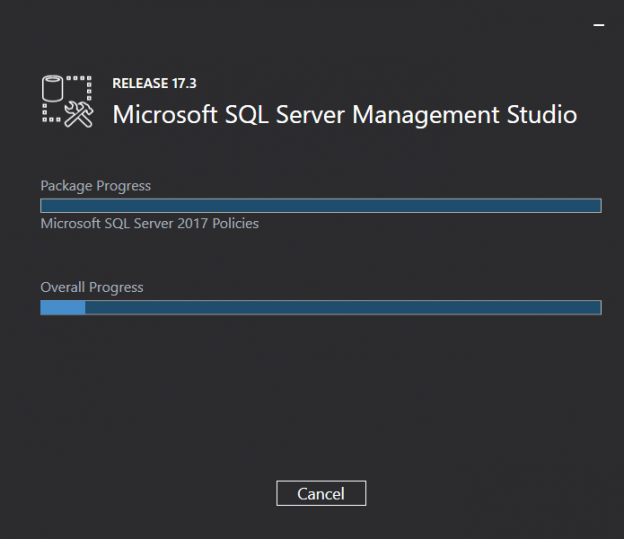 SQL Server Management Studio 17.3 is released now, with build number 14.0.17199.0. In this new build, Microsoft updated the SQL Server Management Studio by fixing a number of bugs in the previous SSMS versions, and added two new features to the current version. Problem in the Extended Events “Watch Live Data” when the default database is not master. Inconsistent icons for the disabled jobs in the Job Activity Monitor. An issue with the “Generate database script” that is not working when the user has a paused DW database on the server. An issue when you choose a Custom date range in the “Top Resource Consuming Queries” or “Regressed Queries” graphical reports for Query Store, where the report will ignore the custom date range input and returns information for the past 24 hours instead. Although the “Match Script Settings to Source” option is set to True, the resulting comments in the script are misleading. Scripting for “Alter” or “Execute” on some database objects is not allowed when connected to an Azure SQL database. Intellisense issue when working against Azure SQL databases. Creating a Linux AG when the primary is on Windows is not possible. Facing “Out of Memory” errors when running queries in SSMS. SQL Server Profiler is not working with SQL Server 2005. Activity Monitor is not working when running the SQL Server instance on Linux. The Import Flat File wizard that provides an easy way with the minimal required effort to import CSV or TXT files. The XEvent Profiler node in the SSMS Object Explorer. In this article, we will go through these two new features in details. The Import Data wizard, existing in the SQL Server Management Studio, provides us with a wide range of import capabilities, by configuring the different available options that are required to build the SQL Server Integration Service package. However, in order to import files with a complex row, semi-structured data structure, such as the flat files, it is better to use a simple task that requires the minimal user configuration effort. The new Import Flat File wizard provides us with a simple way to copy data from a specified flat file, with CSV and TXT extensions, to a destination table, that we used to perform using the Import Data wizard, reducing the amount of effort required from the user to import the complex flat file structure. The Import Flat File wizard simplifies the flat files import process using an intelligent framework known as Program Synthesis using Examples, also called PROSE SDK. The PROSE technology identifies the input file structure by analyzing the file’s data pattern to specify the column names, types and delimiters, minimizing the knowledge required and effort performed by the user to import the flat file. You only need to provide the wizard with the input flat file and a destination table name. The Import Flat File wizard can work when connecting to SQL Server 2005 instance and higher. Connect to the SQL Server instance using the SQL Server Management Studio. Expand the Databases node and select the database to which you need to import the flat file data. SQL Server Extended Events were introduced the first time in SQL Server 2008 as an alternative event handling system to replace the SQL Profiler tool, due to its impact to the SQL Server instance performance. Although the Extended Events provide a flexible definition and views, it still suffers from the lack of a quick view capability that is available in the SQL Profiler. The XEvent Profiler is a new customizable feature, integrated into the SQL Server Management Studio 17.3 version, which provides a quick live streaming view for the diagnostics extended event. The XEvent Profiler differs from the SQL Profiler in that it is integrated into the SQL Server Management Studio on the top of the SQL Server scalable Extended Events technology. In addition, the customizable session that is created to view the Extended events is less intensive on the SQL Server instance and less resource consumer than the SQL trace session created using the SQL Profiler. The result displayed in the XEvent Profiler can be also shared as a .viewsetting file. The XEvent Profiler can work when connecting to the SQL Server versions that support the XEvents. When you expand the XE Profiler node, you will find two predefined session templates: Standard and TSQL, with no available option to add extra ones by the user. From these two sessions, double-clicking on them, you will create a new XEvent dedicated session; QuickSessionStandard and QuickSessionTSQL XEvent session accordingly, and be able to start it and open the Live Data View directly in the SSMS, from where you can watch the SQL Server Extended events for troubleshooting purposes with no need for any extra configuration. The QuickSessionStandard session replaces the Standard template in the SQL Profiler, capturing all stored procedures and T-SQL batches running to monitor the general database activities of the SQL Server instance, by collecting XEvents such as login, logout, rpc_completed, sql_batch_completed and sql_batch_starting. The QuickSessionTSQL session replaces the TSQL template in the SQL Profiler, capturing all submitted T-SQL statements in order to debug the client applications, by collecting XEvents such as login, logout, rpc_starting and sql_batch_starting. SQL Server Management Studio is a GUI tool that is mainly used to perform different administration and development tasks in the SQL Server instances. In this article, we mentioned a number of important bugs that are fixed in the newly released SQL Server Management Studio 17.3 version. In addition, we described in details the two new features that are included to that SSMS 17.3 version, that are Import Flat File wizard and XEvent Profiler. Is this the end of SQL Profiler?